They call it the pinnacle of analogue music reproduction: the patented Statement TT1 tangential tonearm developed by Clearaudio has been copied many times, but never matched. This pinnacle of tangential tonearm technology is a key yardstick for Clearaudio's development team. With the Statement TT1, records are replayed as they were cut – in a straight movement with no curves. Hence the cartridge's stylus tracks the record groove perfectly without errors. 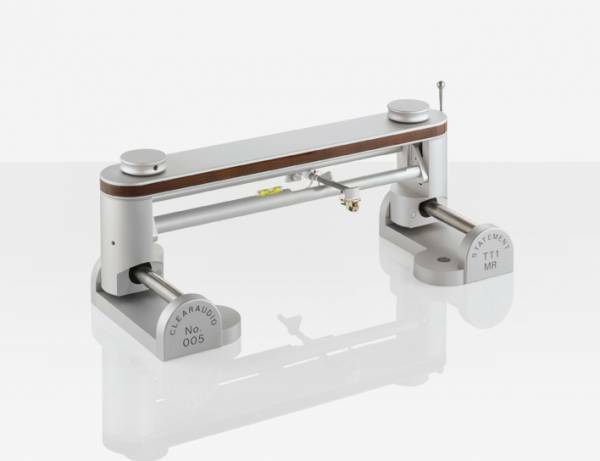 In addition, Clearaudio uses a unique passive technology: a self-sufficient tonearm drive with a purified mechanical design was created to combine optimal resonance values with maximum freedom from interference in the transmission of the music signal. In the TT series, Clearaudio uses accurately crafted high quality materials that are subject to ongoing quality control. Stability and value come first. Uncompromising consistency and ongoing innovation and development make Clearaudio a pacesetter in tangential tonearm technology, always moving towards the perfect audiophile listening experience. Related links to "Clearaudio Tonearm Statement TT1"
Customer evaluation for "Clearaudio Tonearm Statement TT1"